A business management major is a diverse field of subjects that you can choose from to do a major in the business management arena. Some of the popular major degrees include agricultural business and economics, business administration/ management, business economics, business education, business statistics, E-commerce, entrepreneurial studies, finance, hospitality administration/management, hotel management/administration, insurance, international business, labor/industrial relations studies, operations management, etc. Business management is the process of devising the strategy, policy, and the procedure for the management of the business in the short and the long-run. It involves organizing and synching the resources available to the organization and putting it to optimum use to generate revenue for the organization. Every individual who desires to become something in the business world, be it an entrepreneur, a manager, an employee of the top organizations has to enroll into a business management course. It is a diverse field that offers the opportunity to individuals in all kinds of professional domain. The scope of this field is increasing very rapidly as more and more managers are required by the growing corporations worldwide. The complexity of the business environment has also contributed considerably to the demand of degree in this field. If you are one of those who can get along with people, have an affinity for technology and business, with an excellent communication skill; then you are probably a good fit for business management. The skills required to be successful at business management are the ability to work alone and think critically. The persons should also be able to solve complex problems and the knowledge of financial statement and data are always a plus. 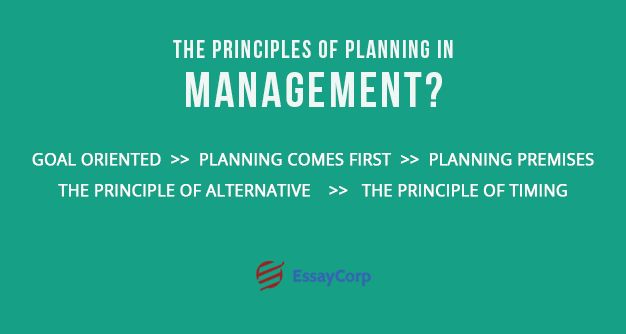 What Are The Principles Of Planning In Management? Goal Oriented – The planning is for the purpose of achieving the organizational goal. Every activity in the plan must be focused towards achieving that. Planning Comes First – The first and the primary function of a manager is to plan. Planning comes before any other activity. Planning Premises – It is essential that the plan is effective and for the purpose of that premises are formulated and the process of planning should be based on that. The Principle Of Alternatives – It is always best to formulate alternative plans and the best plan from the alternatives should be chosen for execution. The Principle Of Timing – It is an essential part of the planning to determine the exact time to launch a product as timing is an essential factor in the determination of the success and failure of the product. The Principle Of Flexibility – A plan should always be flexible so that it can adapt to the challenges and the contingencies that might arise unexpectedly. The Principle Of Comparative Strategies – It is always a good idea in a competitive business environment to observe the plan of the competitor before formulation your own plan. The Principle Of Commitment – The objective to be achieved by the plan should not be timeless; there must be a time bound in which the plan should be achieved. What Are The Three Types Of Managerial Skills? 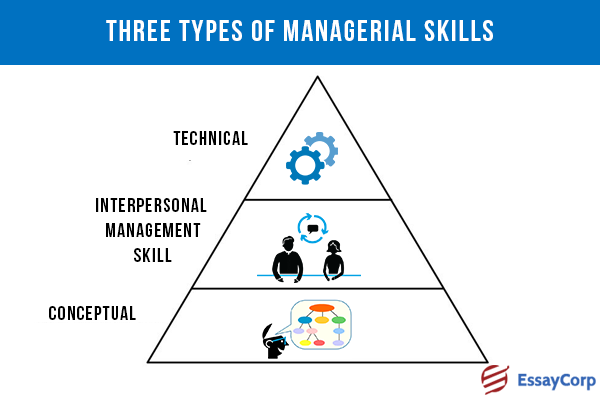 There are several types of skill that a manager requires or a student opting for a course of business management must possess, but the most vital of all the skills are three skills that no manager can do without and the absence of anyone immediately disqualifies the individual as a candidate. Technical – These are skills that a person hones through study and experience, it is the use of machines and technology that allow him or her to be the best at their job. It is knowing each and every aspect of the job one does and due to this adeptness at the job the individual becomes qualified to be a manager in his or her field. Interpersonal Management Skill – It is probably the most important skill that an individual can possess in order to be a manager. A manager is always around people and he or she must be a people’s person because organizations run with the help of people and being a leader, it is the role of the manager to instruct people and interact with them. Conceptual – These are skills that allow the manager to see things that others would otherwise miss. By looking at the analysis and diagnostics the manager can predict the future of the business or the department. 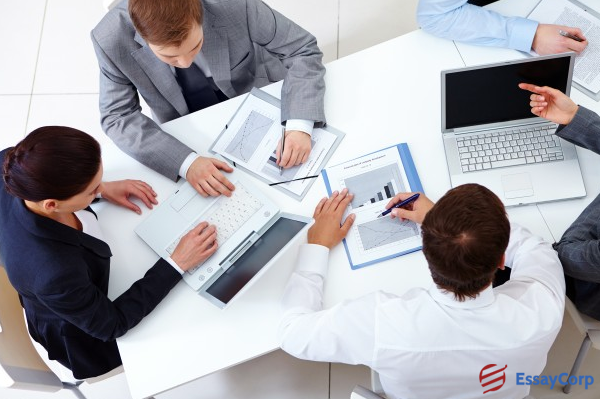 Business management is a quickly growing field with diverse professional scope. Some of the famous roles that a business management graduate qualifies for are human resource officer, logistics and distribution manager, marketing executive, retail manager, sales executive, systems analyst, UX analyst, etc. These are just a few of the roles that a business management student is sought for. Therefore, if you are a student of this course there is a bright future to look forward to and who knows someday you might own one of the Fortune 500 companies.